We’ve got an interesting batch of photos to share with you this week. We’ll start again in the engine room, this time with the salt water feed system. 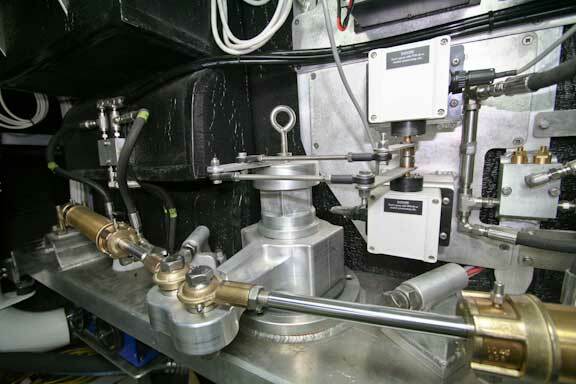 In the foreground is the aluminum weldment which makes up the distribution manifold. The caps on top of the manifold are for inspection. This is fed by dual strainers, either or both of which can be used. The single through hull is a welded aluminum standpipe, with a prestrainer and clear plastic inspection lid, which we have discussed before. 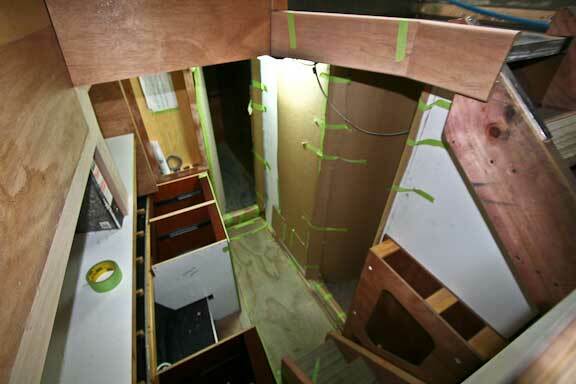 It is really hard to capture the feeling of space inside the boat with photos, but this comes close for the engine room now that the systems are almost completed. 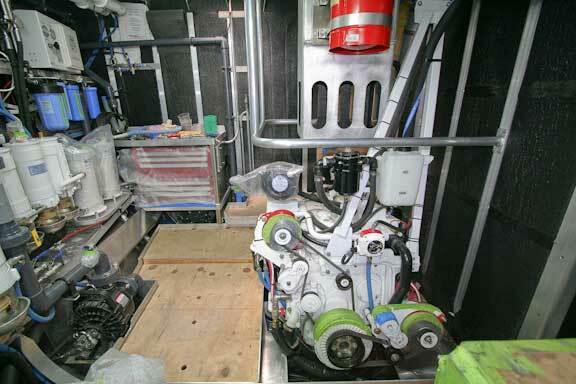 Obviously lots of room to port of the engine and adequate space to starboard for maintenance (injector pump mainly). This next series of photos will give you a feel for the office area, adjacent to the guest cabin. Here we are looking down from the great room level. Here the camera has panned to port (right in the photo) to show the extent of the passageway. Looking now to starboard and where the office desk top will eventually reside (on top of the open furniture bases). 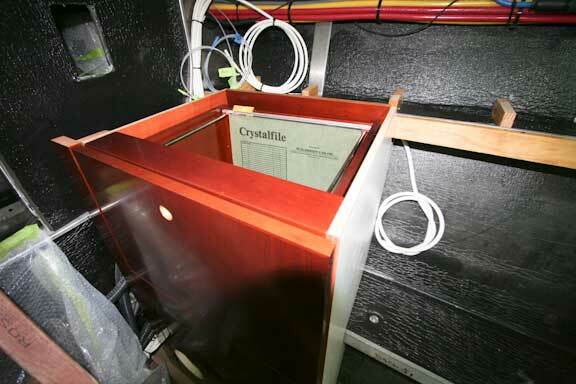 The shelf (with the sample three ring binder centered) will be a great place for ships manuals and cruising guide books. There is clearance above the bench to easily fit a pair of 25″ wide screen monitors, or one of the new Imac 27″ computers, with space for a printer and other accessories. There is lots of shelf storage space aft and a large file folder drawer forward. 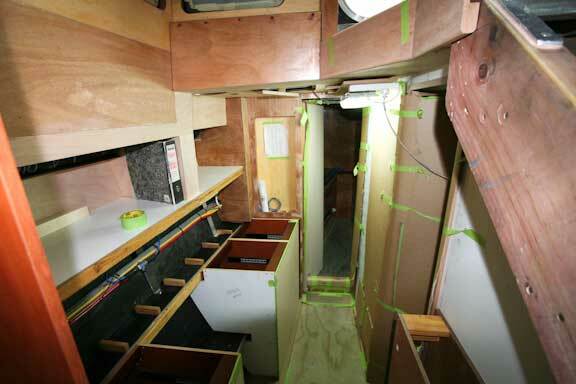 Moving aft now, we are looking at the starboard guest/crew cabin. 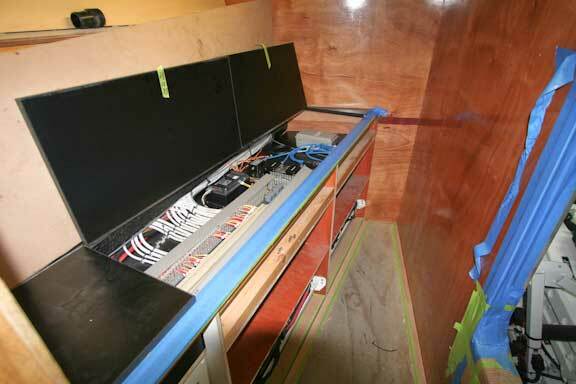 The main DC wiring loom is now installed, ready to connect the DC circuit breaker panel (which mounts in the bulkhead at aft end of the office). The steering system and autopilots (there are two pilots standard) are now installed. Note the loops of excess cable to the pilot motor controllers and rudder angle sensors. We always specify extra cable length so the cables can be switched to the opposite unit. This makes it easy to diagnose problems (rare with this gear). This photo says more about the FPB 64 than just about anything we can think of. Note the detailing of the steering tiller (CNC machined from a solid block), rudder stops, and even the rudder angle sensor arms. 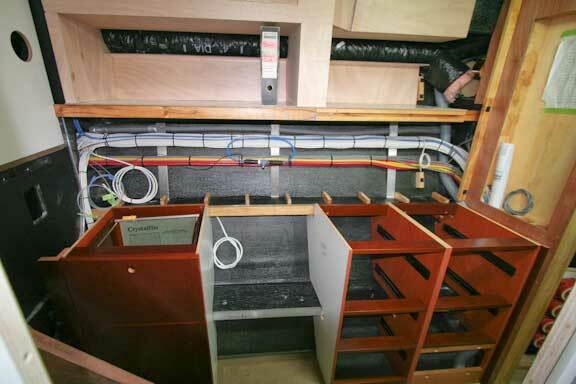 This approach to engineering is carried out where you can see it and where it is hidden (such as the wiring loom under the starboard bunk previously shown). 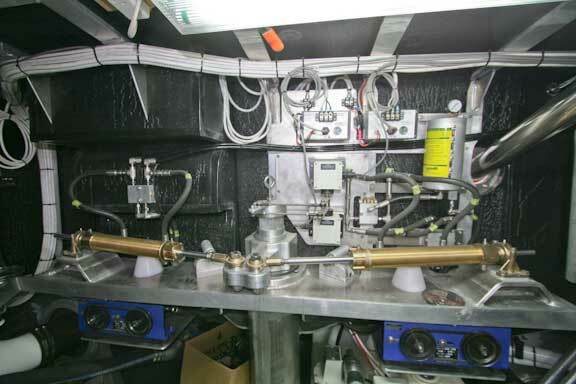 Next to primary structure, systems engineering is the most important ingredient to successful cruising. Get it right and your cruising is a pleasure. Mess up, with built in headaches and ongoing maintenance issues, and frustration takes hold. We are off Monday to New Zealand for a first hand look at the four FPB 64s now underway. We shall report in detail in ten days. This entry was posted on Friday, November 13th, 2009 at 12:49 pm and is filed under FPB 64 Updates. Both comments and pings are currently closed. What is your normal procedure with the intake strainers? Do you leave both open in case a partial blockage leaves some flow thru both, or do you leave only one open in the event that one plugs so as to have the second as a “spare” if plugging occurs? On a separate subject, some time ago I asked about the number and contents of the Overboard Bags you keep on your dink. Time and circumstances at that moment did not allow a response from your side, but I would appreciate your thoughts. The FPB 64 salt water intake system has evolved from what we have been using on Wind Horse. The main difference is the addition of the single large standpipe to feed the dual strainers, with a pre-filter within the standpipe. Any large blockages of the pre-filter (large clumps of weed or plastic bags) can be cleared by dropping a mop handle down the valve in the clear plastic top. This approach reduces the work which the dual primaries have to do. On Wind Horse we laeve both of the primary filters open. In 4400 hours we have yet to find significant blockage in them, so we are probably oversized, which is not a bad thing. I’ll answer your question on what we carry in the dinghy for emergencies when I get back from New Zealand. I want to say that I whole heartedly agree with your philosiphy on systems engineering. 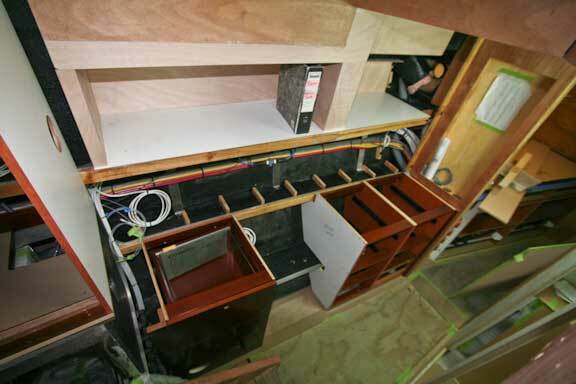 Far too many boat builders consider this way down the list of priorities when designing a vessel. I really like your sea water manifold with the lids. Very smart! I’m curious what you mean by a pre-strainer. perhaps you could put in a photo sometime? I have some hydraulics questions. I haven’t gone through all of your posts so I’m wondering if the truster and windlass are hydraulic? is the damage control pump actuated by a solenoid valve? where is the control for it located? what type of hydraulic pump is on the engine. is it driven by a pto on the engine or transmission? Is it a constant displacement or a “load sensing” type? The windlass and thruster are electric. 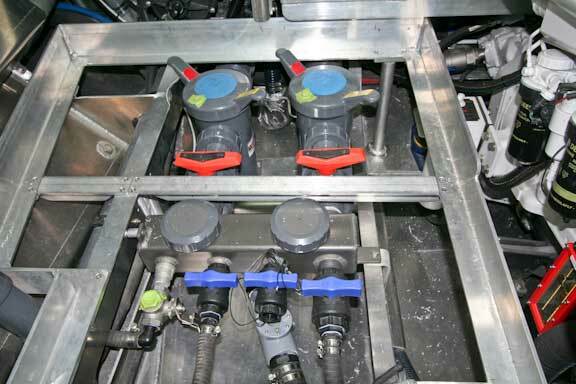 Running these hydraulically adds a layer of complexity we would rather do without. The crash pump, which is hydraulically driven, can be manually operated, turned on/off with a switch, or run automatically with the bilge pump reed switches. The hydraulic pump runs off a B-pad on the transmission. It is a load sensing pump (costly, but efficient).